Foster kids are usually thought of as ‘having it rough’. They come from broken homes, move around frequently and this series of events will follow them into adulthood. This stereotype is glaring, leaving little room for facts. We’ll tell you some of the truths about foster kids, good and bad, and hope you go away feeling slightly enlightened (or more sobered) about the subject. Not all foster children are at a disadvantage when they grow up, despite the stereotype. Some are adopted into their foster families and have a stable, healthy lifestyle. Some foster children have gone on to become carers and caseworkers. Others work in a range of jobs, from baristas and warehouse workers to 9-to-5 office jobs. This is unfortunately true in most circumstances. The Australian government and non-for-profit CREATE, estimate over 70% of foster children were ‘repeat clients’ of the system. The cycle of abuse in families, whether it be physical or otherwise, is hard to break. Hence children reappear in the system after they go back home. Another disadvantage is not having other basic life skills they need to live comfortably. One example of this is Hayden Frost*. In a report by the ABC, he is considered a success story of the system in the fact he has a stable job and a good home. But he doesn’t have a driver’s license because he had nobody to help him. 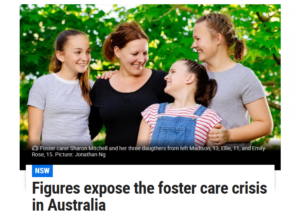 In New South Wales, as reported in 2016, there’s an urgent need for at least 660 new carers for the overwhelmed foster system. An increase in carers would mean 300 children could instantly be moved to new homes and therefore to safety. Dissatisfaction with the disruptions that came with moving frequently e.g. settling into home, changing schools etc. Pregnant women in unfortunate circumstances are tagged by the child protection system during their pregnancies and can be separated from their babies in the hospital. This can occur to mothers with a history of drug and alcohol abuse, as well as women who have no place to live and often sleep on the street. Infants are brought into care straight from the hospital, at only a few days old. Though not often reported, this can happen if the home is deemed safe for the foster child to return to. Sometimes removal is a wake-up call for parents to turn their life around.